The follow-up to Nike’s game-changing Flyknit Trainer has arrived. Please welcome the latest addition to Nike’s knitted sneaker series, the Flyknit Lunar1+. With an upper made from polyester yarn, the Lunar1+ is pretty similar to its predecessor in terms of breathability, lightweight build, and a sock-like fit. Once more, the Flywire cables make an appearance on the upper to give the shoe some structure and support. The biggest update in the Lunar1+ is its Lunarlon cushioning system (something the Flyknit Trainer lacked). Anyone who’s worn a Nike performance sneaker lately can attest to the quality of the Lunarlon midsole. But in case you haven’t, the innovative Lunarlon material is 30 percent lighter than traditional Phylon, which gives it an ultra-plush feel, along with a springy response. The marriage between the Flyknit upper and the Lunarlon sole is something that we were banking on seeing from Nike, and we sure are glad the Swoosh delivered. 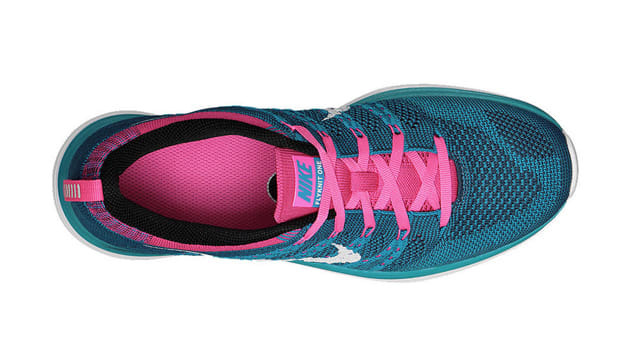 The Flyknit Lunar1+ weighs in at 8 ounces, and is Nike+ ready for runners who want to keep track of their progress.